You are here: Home / furniture makeover / Try this Easy Ikea Play Kitchen Hack Tutorial! Transform the DUKTIG play kitchen from IKEA with this easy tutorial on a budget using paint and wrapping paper to give it personality. Hi there! 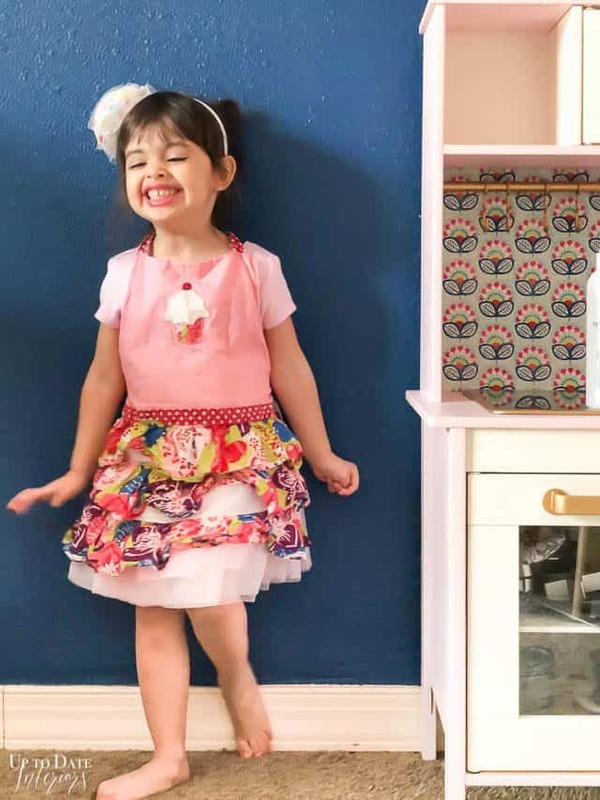 I have such a cute tutorial for a play kitchen today and even a cuter little model. For $25 you can completely transform the DUKTIG play kitchen with some creative thinking and the power of paint. *This post is sponsored by Velvet Finishes. As always all thoughts and opinions are my own. Thank you for supporting brands that help make this blog possible. Tape off around front cabinets before painting if your kitchen is already assembled. Otherwise, you can paint pieces individually. Use the Velvet Finishes easy three step painting process to update the play kitchen color. Prep the kitchen by spraying Velvet Finishes’ ready, let sit, and wipe off. Give the kitchen two coats of paint colour. Brush on a coat of protect once the kitchen is dry. Spray paint handles, sink , and accessories with gold spray paint. Cut a piece of cardboard to fit opening in the back of kitchen. Decoupage dollar store wrapping paper (or other craft paper) by combining one part glue and one part water. Apply with a brush on the cardboard, lay the paper on top, and apply a second coat of glue. Attach the cardboard backsplash to the back of the kitchen once it’s assembled with hot glue or a staple gun. Isn’t my niece precious? We had such a good time doing a photo shoot and her room is adorable! My sister and I recently created the wall gallery above the play kitchen. What a fun space for a cute little girl! We’ve already had many tea parties and lunches. My sister did such a fantastic job turning the nursery into a big girl room. I hope to share the rest of it with you soon! Don’t you love an easy furniture makeover? Velvet Finishes is my favorite paint for these types of projects. There is such a great color selection and it’s so easy to use. You can see some other examples with my daughter’s mint dresser makeover and most recently, our small bathroom makeover on a budget. 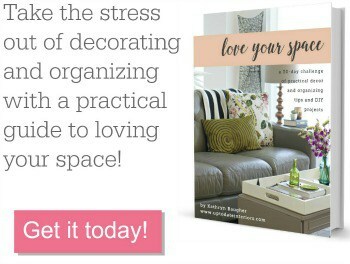 And I have more plans for furniture makeovers next month! You are talented young lady and your model is out of this world. Isn’t she a doll? Thanks!